And the Dragon*Con costume photos continue! After the first set, here’s a round-up of more Flashes (and one other speedster) spotted on Flickr. 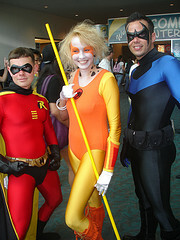 This entry was posted in Fandom and tagged Cheetara, Cosplay, Costume, Dragon*Con on October 19, 2010 by Kelson. 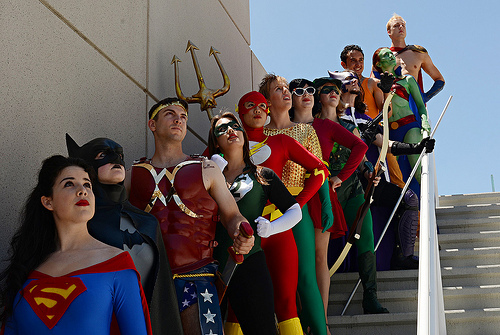 If the number of Flash costumes at Comic-Con International last week is any indication, the fan base is energized. Most years I only see one or two Flashes, if any. This year there were at least three Jay Garricks including myself, two women who made variations on the costume, one man in a Black Flash costume, a Kid Flash, and a Captain Cold. Here’s a gallery of photos from Flickr. I don’t think I’d ever seen a Golden Age Flash costume at a convention until I saw some photos from HeroesCon and Wizard World Philadelphia in June. There seemed to be one Jay Garrick at each. So I figured I’d probably be the only one at San Diego. Imagine my surprise when I ran into not one other, but two! 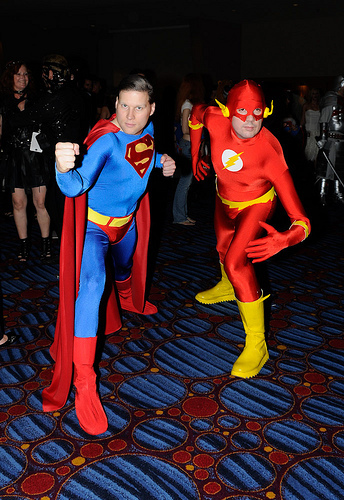 The photo on the left shows me and a cosplayer who was part of a Justice Society of America group I spotted in line for the DC Nation panel on Friday. I asked the person behind me to save my place in line, walked along the line to where they were, and we did the obligatory “Nice costume!” exchange, then ended up posing for a bunch of photos. We did at least two poss, this one and one just standing and crossing our arms like the Alex Ross poster. Someone got an interesting shot with a blur effect, also. I ran into the guy on the right on Saturday, when I wasn’t in costume. He actually used an original World War I helmet, polished it up, and made wings for it…then the first day in town the wings broke, so he needed to come up with a substitute fast. He ended up gluing popsicle sticks together and spray painting them gold. Update: Speaking of the helmet, here’s how my helmet was made. Update 2: and here’s how we made the boots and shirt. I didn’t manage to see any of these three in person during the con. But they’re really cool variations. Creative variation – costumes that take a concept and put a deliberate spin on them. The Steampunk Flash from the League of Justice-Minded Citizens, for instance. 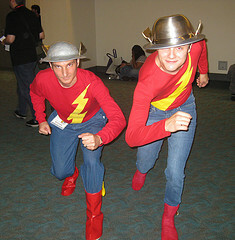 Or either of the female Flash costumes here. So it’s not a problem to take the basic red-and-yellow lightning motif and build on it. People will still know who you are, especially if you keep the white circle around the lightning bolt. 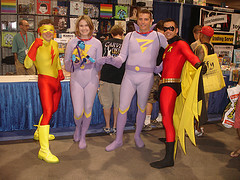 Update August 28: The woman on the left appears to be wearing an off-the-rack costume rather than a custom variation. I almost missed Captain Cold here. It was late Saturday afternoon, and I was on the phone with my wife trying to work out dinner plans. 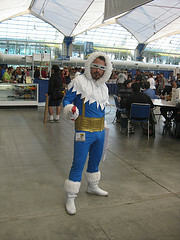 I saw him through the window, said, “Hang on, I need to get a picture of Captain Cold” and ducked outside into Sails Pavilion. Kid Flash was there on Sunday. Sterling Gates, who had been announced the day before as the writer of an upcoming Kid Flash series, posted, “I just met Kid Flash! He’s here!” I kept looking for him the rest of the day, but had no luck. Fortunately, Comic Con has a lot of people with cameras! She may not be a Flash character, but here are two women dressed as Cheetara from Thundercats. Hey, she is a speedster, after all! I saw at least one, possibly two guys in off-the-rack Flash Halloween costumes during the weekend, and one kid who was probably about 6 or 7. 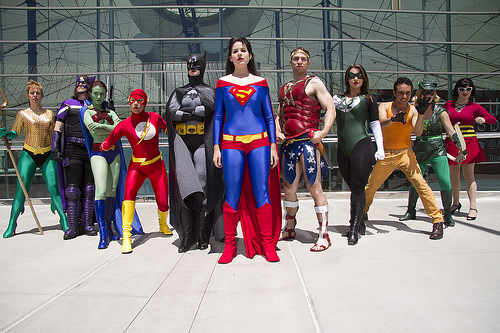 So…did you see any of these people at the con? Did you see another Flash that I’ve missed? 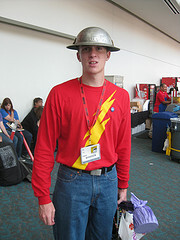 This entry was posted in Fandom and tagged Black Flash, Cheetara, Cosplay, Costume, Jay Garrick, Kid Flash, San Diego, SDCC, SDCC 2009 on August 3, 2009 by Kelson.